Emma Purshouse is one of those people I, and so many others, COMPLETELY admire and can rely on one hundred per cent. So when I was working out who I would like Paul Kielty and I to receive specialist training from – to prepare us ahead of giving our own Painting By Pixels workshops at Derwen College and Designs in Mind, in May 2018 – she was the obvious go-to person to ask. The whole day itself was a masterclass in show-not-tell. And all the points are properly welded into both our brains. 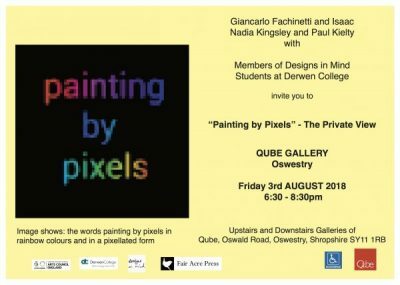 Here is the private view invite – everyone welcome! !